After 19 years (among 3 of blogging), I’m still not able to find the exact words to define my style. I mean, it varies from day to day! For example, what if Monday you spot me wearing high princess-like heels with a woolen Tara Jarmon coat(to ‘fabulize’ this day of the week a bit up), and then Wednesday you walk into me and notice the grungy jeans I’m wearing above my Pinko biker boots. I’ll share with you one little secret. If you would live in the same city as me, this scenario would cross your path day by day. My outfit depends on my mood. On days I feel like I’m not in the mood for anything, I don’t hesitate and pick the biggest sweater in my closet and wear it with a smooth feeling jeans. Because yes, also fashionbloggers need a day off. We aren’t robots with good taste and sense of fashion. Contrary to these days, there are the normal, ordinary days. I enjoy picking every piece carefully, and checking if they match. Most of the time, I already have the outfit in mind I’m going to wear the next day. What’s even crazier, is that sometimes it’s the last thing I see before falling to sleep. It’s not even that I have been thinking about what to wear. It just pops up inside my head, and I can picture it myself clearly. That’s a fun, and at the same time weird fact about me, right? Whenever I feel like the world is hitting down on me (read: there weren’t any Leo’s left in the vending machine on campus, or the coffee machine broke down), I dress up in clothes that make me feel like I can conquer the world. 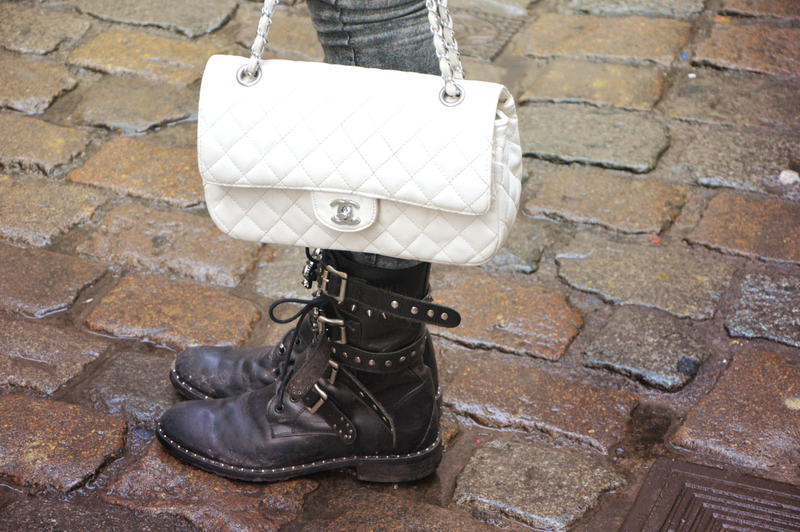 A touch of glitter, heels, or a Chanel bag. It all quite has the same effect. My weekend has been quiet calm. I worked for school a little (need to study some more from now on though…) and visited my grandparents. It warms my heart whenever I see their smile on their wrinkled cute faces, seeing me for some time again. I believe they are one of the best friends you’ll ever get. Enjoy the rest of your lazy Sunday, as for me, I will scroll all over the Internet looking for a new ball gown… Anyone suggesting a good webshop?